Rests your finger and makes products linger! The IK Foam 1.5 Sprayer is a professional level pressurized sprayer that is designed to generate the perfect level of foam to optimize the effectiveness of your products. By using a special pressurizing system, the IK Foam 1.5 Sprayer will allow you to not only generate a more consistent application of product, but it will also save you quite a lot of hand fatigue in the process. The IK Foam 1.5 Sprayer comes with various different nozzles that will not only generate a sufficient foam with any product but will also allow you to choose which TYPE of foam you’d prefer! The IK Foam 1.5 Sprayer can be used with pretty much any product on the market today due to its highly chemical resistant nature! 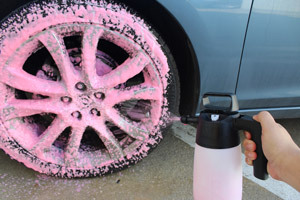 The large majority of products that you will use on your car’s paint are meant to be applied by spraying them on the surface. While it is possible to use the traditional sprayer to apply these products, the IK Foam 1.5 Sprayer was designed to make the spray application of such products much easier and more effective than what you are used to. The IK Foam 1.5 Sprayer accomplishes such a task by introducing many innovative features that you will be able to greatly appreciate! The first of these features is the IK Foam 1.5 Sprayer’s ability to generate a thick foam out of any product that you use it with. When you are applying a product like an All-Purpose Cleaner or a Degreaser, the product will be able to work much more effectively in a foam form. The foam allows the product to stick to the surface longer without simply running off immediately. The longer the product is on the surface, the more time it is allowed to work and generate the results you’d like to see! Using the handle on the top of the IK Foam 1.5 Sprayer, you can generate plenty of pressure for spraying. Once that pressure is built, pulling the trigger will spray a thick layer of foam on the surface! Another feature of the IK Foam 1.5 Sprayer that we can all appreciate is the vast reduction in hand fatigue that it affords to you. Applying a product like a Spray Wax or Quick Detailer requires a lot of product to work effectively. 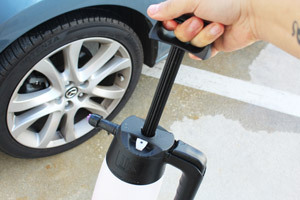 When you are applying it to your entire car, you will start to feel your hand cramping as you pump away with traditional sprayers. With the IK Foam 1.5 Sprayer, however, you can generate a large amount of pressure at once and gradually use that pressure to apply your product over a longer amount of time without the need for constant pumping! Throughout your detailing expeditions, you are bound to use a wide range of products, some of which will be much more corrosive than others. The IK Foam 1.5 Sprayer saves you from having to worry about these more corrosive products eating away at your sprayer from the inside out. Due to the Polypropylene and Polyethylene tank and the high-quality FPM Viton® seals and washers, the IK Foam 1.5 Sprayer is capable of handling even some of the harshest chemicals used in the detailing industry!